Although it is a common male name in Turkish (Cihat), the Turks, and apparently many others too, have a confused mind about the Arabic word "jihad." Most Turks have felt contempt for "the jihadist terrorists" of al-Qaeda. They feel the same for the "jihadist/Salafist" Islamic State that captured large swathes of Syrian and Iraqi territory this summer, and took hostage 49 Turks, including the consul general, at their consulate compound in the northern Iraqi city of Mosul on June 11. At the same time, thousands of Turks identified themselves as "jihadists," just like the IS's men, when they took to the streets to protest Palestinian casualties and attack Israeli diplomatic missions in July and August. 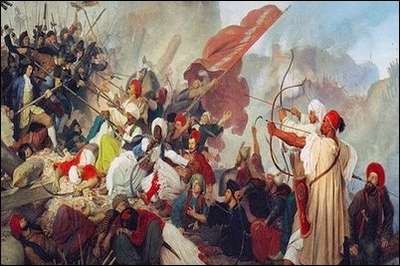 In 2013, now Prime Minister (then foreign minister) Ahmet Davutoglu sanitized jihad when he said that: 1) There is no connection between jihad (literally, "struggle" in Arabic) and terrorism, 2) Jihad is the name of fighting for our honor, and 3) For us, jihad is a sacred notion. Apparently, the Turks had a jihadist for a foreign minister. Davutoglu's understanding of jihad was probably about how the Quran mentions it 41 times and what the word referred to a millennium ago: an inner, spiritual struggle combined with an outer physical struggle for salvation. In modern history and today, however, jihad is a physical struggle against the enemies of Islam, and it can be violent (just jihad) and non-violent (diplomatic jihad, for instance). Davutoglu said in 2013 that "any attempt to link jihad to violence and terror would be using it like neo-cons and pro-Israelis in America use it." Ironically, more or less on the same day as Davutoglu denied any connection between jihad and terror and warned everyone "not to taint this notion," a prominent Islamist visiting Istanbul reminded everyone what jihad meant. Mohammed al-Hindi, Islamic Jihad's leader, said: "Our jihad began with stones, and goes on with state-of-the-art missiles." It would be more sensible to vouch for al-Hindi than for Davutoglu, as al-Hindi's organization even seems to have a copyright on the sacred notion that jihad is "Islamic," and it fights for jihad. Shortly he founded the Muslim Brotherhood in 1928 (31 years before Davutoglu was born), Hassan al-Banna made very clear what jihad was about: "It is the nature of Islam to dominate, not to be dominated, to impose its laws on all nations and to extend its power to the entire world." Al-Banna was certainly not modest in his goals, and his followers seem no less ambitious. One of political Islam's founding fathers and prominent ideologues, Sayed Qutb, also a Muslim Brotherhood member, declared all non-Muslims to be "infidels" -- a term which justified fighting them. More recently, a 2004 fatwa by Sheikh Yusuf al-Qaradawi simply made it a religious obligation for Muslims to abduct and kill U.S. citizens in Iraq. The fatwa advocated a war of Arabism and Islamic jihad against the British and the Jews. Who is the authority on the meaning of "jihad" -- Muslim Brotherhood founder Hassan al-Banna (left), its current spiritual leader Yusuf al-Qaradawi (middle), or Turkish Prime Minister Ahmet Davutoglu? And, according to Hamas's charter, "the only way to engage in the [inherently irreconcilable struggle:] jihad between Judaism and Islam, between truth and falsehood is through Islam and by means of jihad until victory or martyrdom." It should be clear to anyone with a primary school education that the gentlemen al-Banna, Qutb, al-Qaradawi, and the Muslim Brotherhood and Hamas, are not referring to a spiritual inner struggle for salvation. No idea how an inner struggle for salvation can be achieved with stones and missiles. Last January, thousands of Erdogan fans waving colorful placards filled rally-grounds. One placard read, "You'll never walk alone;" another greeted "Our hero Erdogan." And one particularly popular slogan, accepted with smiles and thanks by Erdogan, was "Jihadist Erdogan" which prompted this columnist to write an op-ed piece, "Jihadist Erdogan." One could have gone to jail for calling Erdogan "a jihadist," but his party loyalists had now perfectly legitimized the description. But once again I was wrong to assume when Turkish Islamists like to be called jihadist and when they do not. I had angered the foreign minister. He told a TV interviewer, without naming names, why I had called Erdogan by the name that the prime minister greeted with smiles and thanks: "This is the crusader's mentality. Or a reflection of the neo-orientalist mentality. This is an explicit attack, not only on the prime minister, but also on the Islamic civilization and faith." Furthermore, "It is an assault," Davutoglu asserted, "to cause our prime minister to be mentioned by a different code, especially by translating that word [the original Turkish word –'mücahit'] into English as 'jihadist.'" So, it was a compliment to call the prime minister by an adjective, but an explicit assault on him -- and the whole Islamic civilization --by referring to him with one of the only two possible English translations of the same adjective. Clearly, this was not a case of "lost in translation." Could the problem be about being a jihadist? No. I have known hundreds of proud Arab jihadists who love to be called jihadists. What makes the case of a "Turkish jihadist" unique, then? Could the problem be about being called a jihadist in English only? The pragmatic and shrewd Turkish jihadist is programmed to maintain a delicate equilibrium where he feels that he maximizes political benefits: He loves to be called a jihadist at home and on the Arab Street, but not on the Western Avenue. He is, instinctively, a part-time jihadist, playing the jihadist at home for domestic consumption and the blessed peacemaker in front of major world powers.